Viola odorata has adapted in means of reproduction by having Formica polyctena ants disperse their seeds. To find out more about their seed dispersal see How do I reproduce? Viola odorata are not alive all year. They usually bloom in the spring, but some do not bloom until into the summer. Their prime flowering months are from March to May. However, they are perennials meaning they come back year after year. For more information on the perennial aspect of Viola odorata see How do I reproduce? Viola odorata is usually between three to eight inches tall. 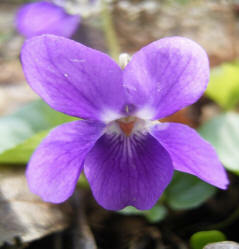 The leaves of Viola odorata are usually dark green, large, hairy and commonly heart shaped. The leaves are basal and have their blossoms on separate stalks from their leaves. The plant's blossoms all have five sepals, five stamens and five petals. Their flowers are usually deep purple, white or pale mauve and they have a subtle scent. To the left shows the different parts of the violet. Another adaptation is that Viola odorata uses a novel suite of cyclotides. Cyclotides prime function in plants is to be a defense against insect pests and pathogens. To learn more about cyclotides click on the icon to the left. 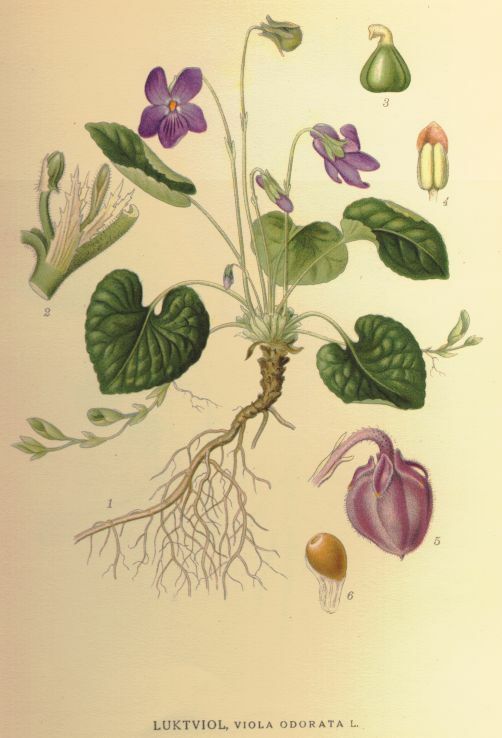 Viola odorata was used in a study to help identify 13 new cyclotide sequences found in plants. However, the Viola odorata itself contains a mixture of more than 50 different cyclotides!